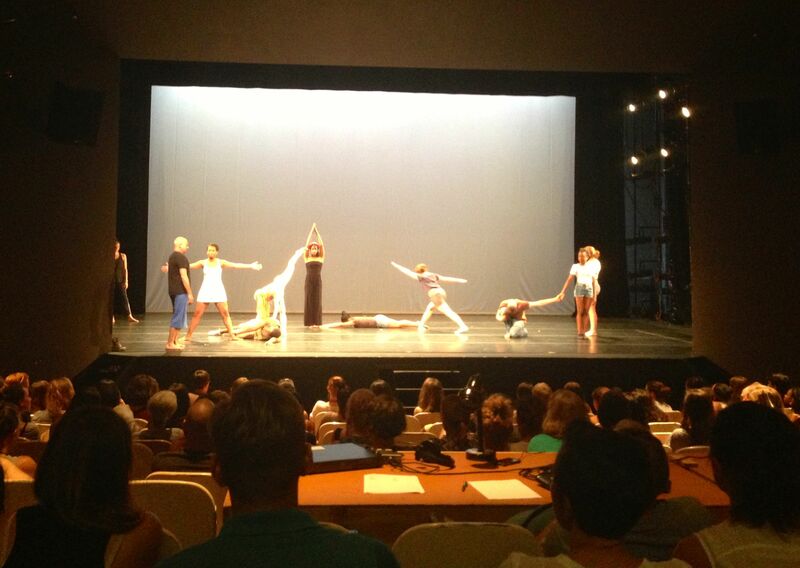 Last night our students piled into Schaeffer Theater to watch the Show & Tell with Doug Varone and Dancers. This will be the 8th time Doug Varone and Dancers have participated in the Festival over the past 20 or so years. This year they will perform, teach and create work while in residency at the Festival. Our students had the chance to see snippets of the company’s repertory along with demonstrations of how Mr. Varone builds his work. After watching an excerpt of Lux, Mr. Varone brought nine of our students on stage to demonstrate how he builds seemingly chaotic but immensely controlled architectural structures on stage. Mr. Varone placed the nine dancers in various poses across the stage, then led each of his dancers through this obstacle course of bodies, giving them different movement material. Dancers made different paths by diving under, pressing against, twirling around and manipulating their human obstacles. What was left once the obstacles were removed was an intricate phrase of human shape moving through the space. Like leaves blowing in the wind, momentum and architecture came alive. 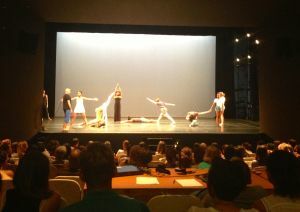 Doug Varone brought nine young dancers to the stage during his demonstration to build an obstacle course for the dancers to move through. In our hall meeting that evening, our students, counselors and faculty members discussed what they most enjoyed about the performance. One of our ballet instructors, Shonach Mirk-Robles noted that she was pleased that many of the concepts Doug Varone brought up during his lecture were ideas our teachers are introducing in classes. Varone cited musicality, vocabulary, architecture and humanity as his core concerns. Many of these foundational ideas are important to all the different instructors, performers, and dancers at the Festival. We have the pleasure of being completely immersed in these processes and ideas while here. We also had fun discussing this idea of chaos in dance at our hall meeting. Some students were surprised by how simple Mr. Varone was able to make it look during his demonstration. In about 10 minutes he was able to make a luscious 20 second phrase using his obstacle course game. Our students were excited to learn the tools that were used to create such intricate looking work. We also began to dive into the aesthetics of the work. Did you like seeing this “organized chaos” on stage? What was challenging about it for you? Why do you think this idea is being used? I loved that our students were pushed to see something new and then articulate why they liked or disliked it. The young dancers will have a chance to see the full performance of Doug Varone and Dancers on our last night of the workshop this Thursday. To purchase tickets to Thursday or Saturday’s shows visit the Bates Dance Festival website.